We woke up to sunshine and lows of 0 in Milwaukee to -7 inland. Wind chills all day were -15 to -25 with winds gusting to 40 mph. Blowing snow was also a huge issue all day after all that powder fell yesterday. Even though it was sunny, we did not warm up much today, only in the single digits, because the sun was reflected off all that fresh white snow. Now that the sun has set, the temps are dropping like a rock and we will be -6 to -14 with wind chills -35 all evening. Tonight is dangerously cold with a low of -22 in Milwaukee and wind chills at least -50. There could be some -60 wind chills well inland by morning. Wednesday will break a record for the coldest high temp for that day at -13. The record is -3. The gusty winds will keep wind chills around -40 during the day. 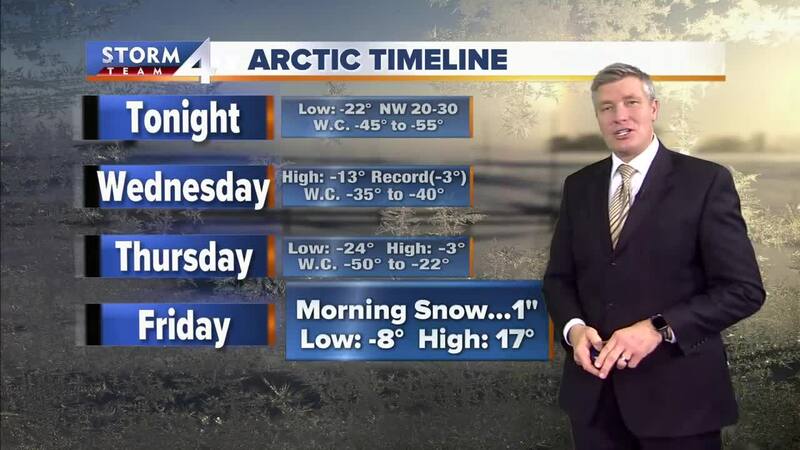 Wednesday night is back to -24 (actual temp). The coldest temp in Milwaukee’s history is -26 in 1982 and 1996. We will get very close to that record. Thursday’s high is -3, but at least the wind starts to diminish to 10-15 mph with afternoon wind chills of -20. Get ready for a weekend warm up thanks to a warm front that will bring about 1” of snow by morning. Friday will have a high of 17, and Saturday will be 36 balmy degrees with a slight risk for a wintry mix. Sunday will be 42 with light rain.